We had to squint so the sun wouldn't blind us while wheeling out of tiny Byron, Minn., on a sunny September Friday. There were three of us, a trio of golf bags and suitcases, one giant box of bottled water and a 2012 Hyundai Elantra that hit Highway 14 at 7:30 a.m.
Destination: Wisconsin. My playing partners — my father-in-law, Dan, and his brother, Duane, both avid golfers — were heading back to the state where they were raised. Me? I was heading into rival territory. As a Minnesotan (now living in NYC), you learn to dislike Wisconsin: the Badgers, the Packers, the cheese, the Packers and also the Packers. But this trip was different. We were kicking off a three-day golf adventure. And as much as it pains me to say it, you won't find much better public golf than the superb tracks Wisconsin has to offer. This trip was a retirement surprise for Dan — the green Masters polo he wore on his last day of work was a sign that, yes, this man was ready for more golf — and Duane and I spent about two months and four dozen emails coordinating days, courses, lodging and, of course, strokes. Then, after we told Dan about the trip, he joined the email chain. There were a lot of emails. "I'm hoping to break 300 for the trip!" Dan wrote, sarcastically. "Hey, 300 is good in bowling. Why not here too?!" [Editor's Note: We all broke 300.] Duane is Dan's younger brother, and he talks a little like Rodney Dangerfield. Dan, my father-in law, is the quieter of the two brothers. They started playing golf at a young age — Dan, who plays lefty, was taught by his left-handed aunt — and both are good players. For years they have met every weekend at their local club to walk 36. Now retired from the IT business, they play more weekday golf. Their daily game has been the same for years, and it has more bylaws than a fraternity. The goal is simple: to play well enough to win a lunch. They value a lunch at $2.50, so if you want more than a hot dog or bag of chips you need to pile up several wins. However, not all victories merit a lunch. To win the aforementioned meal, Duane has to beat Dan by eight, or Dan has to beat Duane by two. You also have to make a birdie to be eligible to win (if you don't make a birdie, you don't deserve to win, they figure). There's more: if you record an eagle during your round, you can't lose lunch (unless your opponent makes an eagle to cancel it out), and if you record an ace you automatically win lunch (unless your opponent matches the ace and cancels that out). Lastly, if Dan breaks 80 or if Duane breaks 78, they can't lose lunch, because who deserves to lose lunch on a good round? I have tagged along for their games a few times when I'm in the area, but this would be our first out-of-town trip together. Creating the itinerary wasn't easy with so many enticing in-state options. Five Wisconsin courses landed in GOLF's latest ranking of the Top 100 Courses in the U.S: Whistling Straits' Straits Course (28th), Sand Valley (52nd), Erin Hills (74th), Milwaukee (84th) and Blackwolf Run's River (100th). Only Milwaukee is private. Three not mentioned above were on GOLF's latest Top 100 Courses You Can Play ranking — SentryWorld (78th), Whistling Straits' Irish Course (79th) and Lawsonia's Links Course (87th) — and countless others not ranked — University Ridge, Blackwolf Run's Meadow Valleys, Troy Burne, The Bull at Pinehurst Farms, Wild Rock, etc. — are no slouches. And then there's Sand Valley's second course, Mammoth Dunes, which will debut in full next year. We kicked off our trip with three-time PGA Championship venue and future host of the 2020 Ryder Cup, Whistling Straits, and rolled into Kohler just after 1 p.m. on Friday. The Straits is the ultimate bucket-list course. It has the PGA Tour pedigree, the challenge and fun factor are off the charts and it's a camera-ready course for first-timers. This was my fourth trip to Whistling, and the views were as good as ever. Several holes run along Lake Michigan, and the sound of the waves crashing against the shore serves as fantastic background music. Pete Dye's links-style layout makes you think you're in Ireland. My playing partners, who were making their first trip to the Straits, were in awe. We had our good and bad holes — Dan drained a 40-foot par putt on the par-4 opener and we were all done in by the difficult 5th — and Dan and I ultimately flipped our scorecards. After playing a solid front nine I unraveled on the back; he did the opposite and beat me by one. Duane got both of us by a handful of shots as we all three battled the wind and rain, which made it an authentic Irish experience. Day 2 was The Bull at Pinehurst Farms, located just 14 miles south of Whistling Straits. While Kohler's four courses might grab most of the headlines, The Bull is an underrated option that provides great golf and an equally satisfactory experience — and at a cheaper rate. You have to hit all the shots. The opening hole is your basic par 4, the 2nd wraps around a lake and the 3rd is a par 3, but the real challenge begins on the 4th, which is a par 5 with a small green. The next few holes demand accuracy as you weave through the woods and try to make the most of a handful of tricky and delicate shots. The back nine is littered with more treacherous holes and intimidating shots, and each of us donated golf balls to the property. The closing 18th perfectly frames a nearby barn and silo as a backdrop, providing a nice Midwest touch. Dan and I tied, and Duane, for the second straight day, took the gold. Inside, the Bull has a tasty restaurant with a wrap-around bar and there's a fantastic deck overlooking the course. There's also another bar downstairs — The Bull Pen Pub — with arcade games, pool tables and more. After The Bull, it was time to start our trip back toward Minnesota, but not without making a final stop on the way. We arrived at Stevens Point, a town of about 27,000, on Saturday night and grabbed dinner at a great local bar called Hilltop Pub and Grill. The next morning we arrived to SentryWorld for our tee time. I had never played SentryWorld, but I had heard of it. You have probably seen the photo of its most iconic hole, the par-3 16th "flower hole" that's had more pictures taken of it than pars or birdies surrendered. 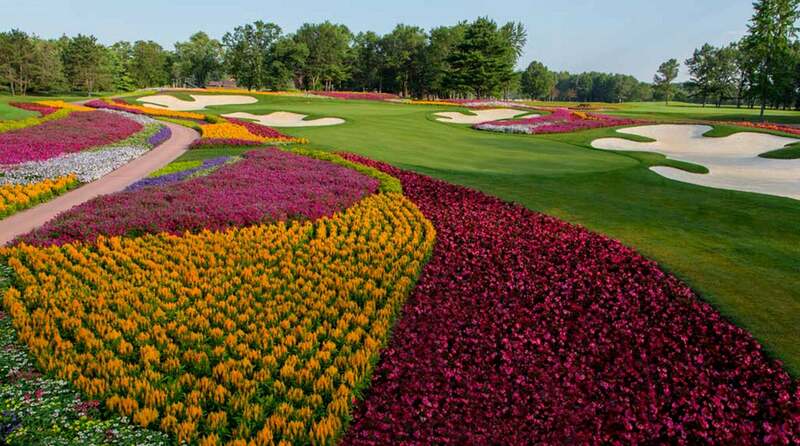 It's simply gorgeous, and the meticulous manicuring of the flowers and area around the green is impressive. The course — and massive clubhouse — was overhauled in 2013. There's now a huge restaurant and expansive outdoor seating area complete with large chairs and fire pits, and it makes you feel as if you are up north relaxing at a cabin. The practice facility is also one of the best I've seen. The range flows seamlessly into a giant putting green, which is just steps from the opening tee. The view from the 1st tee box is gorgeous. The course's perfect condition (so green), its white-sand bunkers and tree-lined fairways (trimmed with room to hit balls underneath them) reminds of classic golf. It first opened in 1982, and its original designer, Robert Trent Jones Jr., oversaw the redesign. (Dan and Duane both played it pre-re-design; they agreed the updates made it even better.) They overhauled several holes, all of the bunkers and more. The finished product is, in my mind, one of the most fun and under-the-radar courses you will find. It's playable for golfers of all handicaps and has so many well-designed holes that no two seem alike. Water hazards became more prominent after the re-design, for those who are suckers for a good view. With the tips stretching to over 7,200 yards, there are lots of options when attacking these holes no matter what tee box you play. The greens can be tough, and the tightly mowed slopes around them will hand you your fair share of tight lies and tricky up-and-downs. Those who enjoy a challenge and a gorgeous walk will love what SentryWorld has to offer. After SentryWorld's brutal uphill par-4 18th closed our trip — Duane finished with a clean sweep, and I was dead last on this day — it was back to the Elantra and on to Minnesota. On the way home we dissected the past three days: the holes we liked, the ones that killed us and the best parts of each course. As our trio of Wisconsin courses stretched farther in the rearview mirror, we couldn't help but think about turning the car around to go back.